“Is the talent there on the FF frontbenchers (sic)? Outside of Micheál Martin and a handful of others you don’t have many household names. Above are a series of suggested questions that were sent from Fine Gael’s digital team to party members last Thursday evening via WhatsApp. 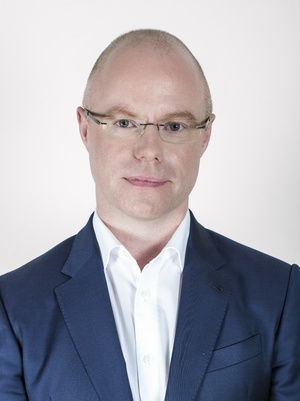 Sunday Business Post journalist Hugh O’Connell reported yesterday that the Fine Gael members were instructed to send these questions – or reworded versions of them – into Newstalk during a live interview with Fianna Fáil leader Micheál Martin last Friday. 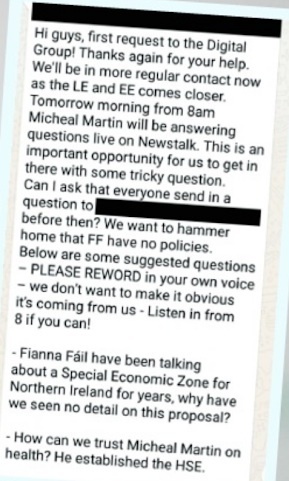 “Leaked WhatsApp messages seen by The Sunday Business Post show that dozens of Fine Gael staff and activists were told by the party’s digital team to reword suggested questions ‘in your own voice’ as ‘we don’t want to make it obvious it’s coming from us’. 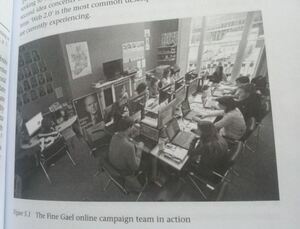 The Fine Gael online campaign team during the 2011 general election. 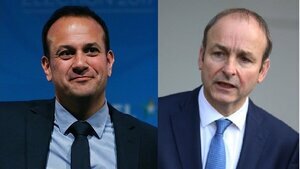 Posted in Misc and tagged Fianna Fail, Fine Gael, Micheál Martin, Newstalk, questions, WhatsApp at 11:52 am on April 15, 2019 by Bodger. It’s almost as if messages sent over WhatsApp have never been leaked before. As well as not living in the real world, Blueshirts are not very bright. Isn’t this exactly what people are accused of doing on these very pages daily? Doesn’t every political party do this? Now that Brexit is sorta tied down for six months, isn’t now the time for the FFers to stand up for this country to withdraw support from the likes of Murphy and Harris? I would have thought that every party does this. Every rte audience is packed full of fairly obvious plants so one would think this so. If not, they are missing a trick. Does SF not advertise for volunteer media people on their website? Great work with the health and housing Fine Gael. You promised, and along the way said we weren’t being patient enough, but we’re going to have to eat humble pie now, because you’ve only gone and delivered. ‘we are normal’ PR campaigns, and your image overhauls and your spin politics, and your Kylie chasing, and your dishwasher photo ops. The important thing is how you look. Not the actual issues. 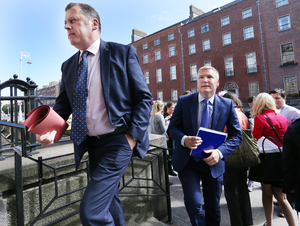 Jazuz…that poster of Noonan in the FG HQ….shudder! Everything else seems pretty normal for a political party on a mission of re-election and to hammer the opposition. Plus FF don’t have any policies. This is so the Thick of It. Full disclosure. I’m part of FGs volunteer online army. Not all of us are paid. Just a regular garden variety sociopath, then. Why on Earth would you do it for free? I enjoy it. 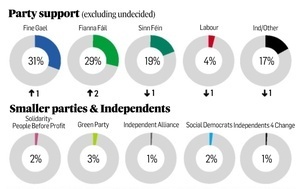 It’s good for the party which is good for Ireland. It’s my bit of public service. There’s not going to be an ominous knock on your door later is there? Because you outed your secret online identity? I admit to being concerned. 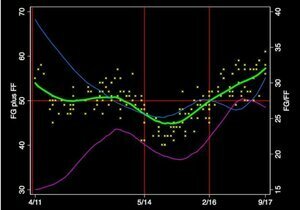 We are clearly all being monitored. Unpaid… The FG dream… . It’s on a par to a fur coat and no knickers . Christ Cian, can’t you keep your whatsapp private?? What’s really pathetic is that the thick Irish Paddy voters on here will still fall for it.. even though they know it’s all bullpoo. Only the daw daws can change it. But don’t we all want politicians to be asked tricky questions? The kind of questions they’re saying they have the answers to so we should vote for them. FF say they have a big fancy housing plan. Is “What is that plan exactly” a tricky question?Either they do have policies, in which case they’ll have answers, or they don’t, and they won’t, we’ll know either way.